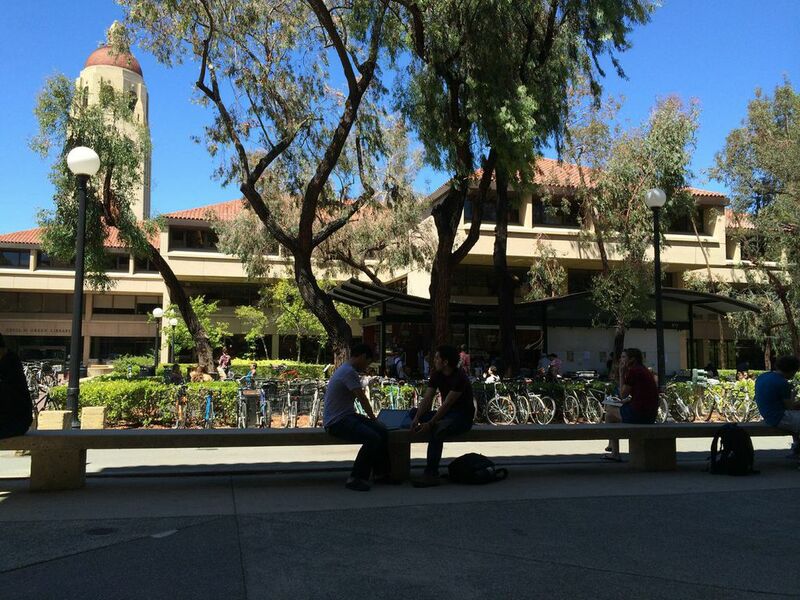 On May 25, 2014, I visited Stanford University in Stanford and Palo Alto, California. The majority of the campus is located in the census-designed place of Stanford, but the Stanford University Medical Center and Stanford Shopping Center is located in the city of Palo Alto. The university was founded in 1885 and opened in 1891. In 2014, Stanford University was the most selective university in the country. The university accepted 5.1% of the students that applied for admission. Stanford University has approximately 16,000 students. Approximately 7,000 of those students are undergraduate students. The student-faculty ratio is 5:1. While Stanford does have large lecture classes with more than 100 students, the majority of classes have less than 20 students. Lower division, or introductory classes such as the ones freshman students would take, is where you’ll find the largest classes. But, freshman will be able to find some smaller classes their first year. Stanford is located on the San Francisco peninsula. The university is one of the largest universities in the United States with 8,180 acres. The university is approximately 37 miles from San Francisco and 20 miles from San Jose. The location is ideal for students looking to obtain internships and jobs because of its close proximity to San Francisco and the Silicon Valley. The area around the campus is very nice. The area includes very nice old homes, as well as trendy areas. I wouldn’t call it a college town, but with the campus is large enough to make it feel like a town of its own. There is much shopping and entertainment on and off campus. There is a lot within walking/biking distance, but the university also offers a free shuttle to other areas. This shuttle comes in handy because freshman students are not allowed to bring a car to campus. The majority of students on campus use bicycles. 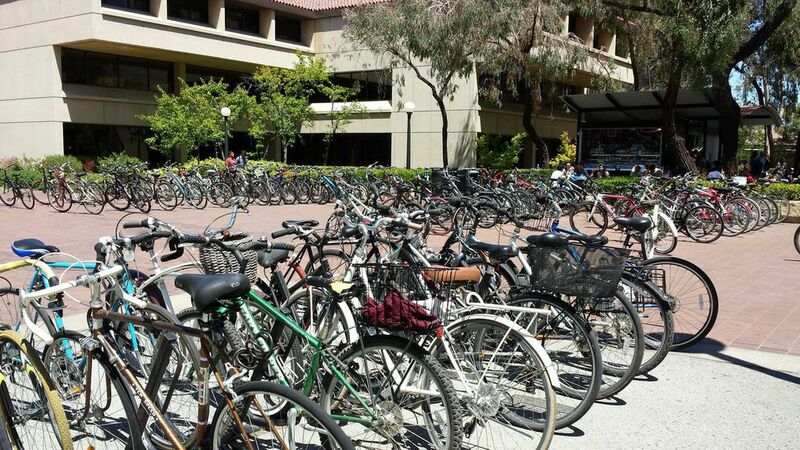 The university states that there are approximately 13,000 bicycles on campus. 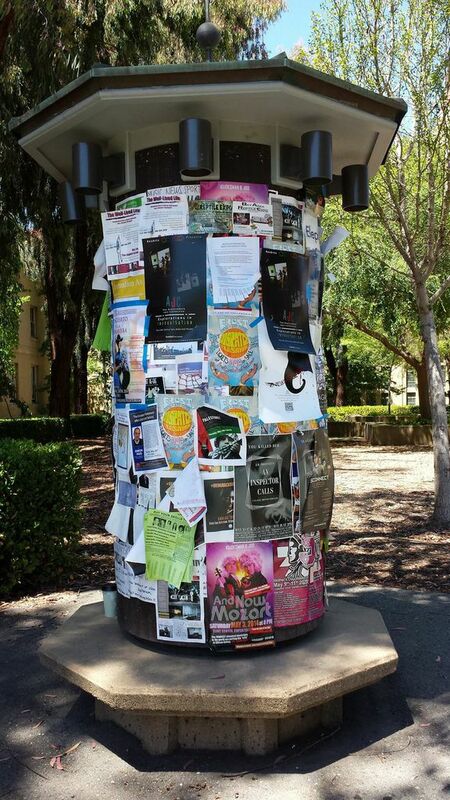 If you attend Stanford University, be ready to be attending a tourist attraction. People from all over the world visit the campus. There will be people taking photos of the beautiful campus all the time. Stanford University is organized into three schools for undergraduate study: Earth Sciences, Engineering and Humanities and Sciences. The top five undergraduate majors this past year were Computer Science, Human Biology, Engineering, Science, Technology and Society and Biology. Most of the world knows about the academic reputation of Stanford University. Why else would so many students apply for admission to the university? The feeling on campus matches its reputation. Stanford University feels collegiate. That may sound a little funny because shouldn’t all college campuses feel collegiate? However, not all colleges have a feel of academia everywhere you turn on campus. Stanford does. Of course you feel it in the classrooms and the library. However, you also feel in the residence halls, the student union and while you’re walking on campus. Everywhere you turn, students are studying or discussing intellectual topics. Stanford University is a research institution. All faculty members participate scholarly research and will typically include students. The majority of students that assist in the research are graduate students, but advanced undergraduate are included as well. Stanford houses many national research centers on campus including the Nature Bureau of Economic Research and the Hoover Institution on War, Revolution and Peace. The faculty at Stanford University is very impressive. There are currently 22 Nobel Laureates on faculty at the university. In addition, there have been 31 Nobel Prize winners, five Pulitzer Prize winners and three Presidential Medal of Freedom winners. Lastly 99% of the faculty holds the highest degree in their field. Many of the faculty members are experts in their fields and have had their work published in books, textbooks and academic journals. The libraries on campus are impressive. 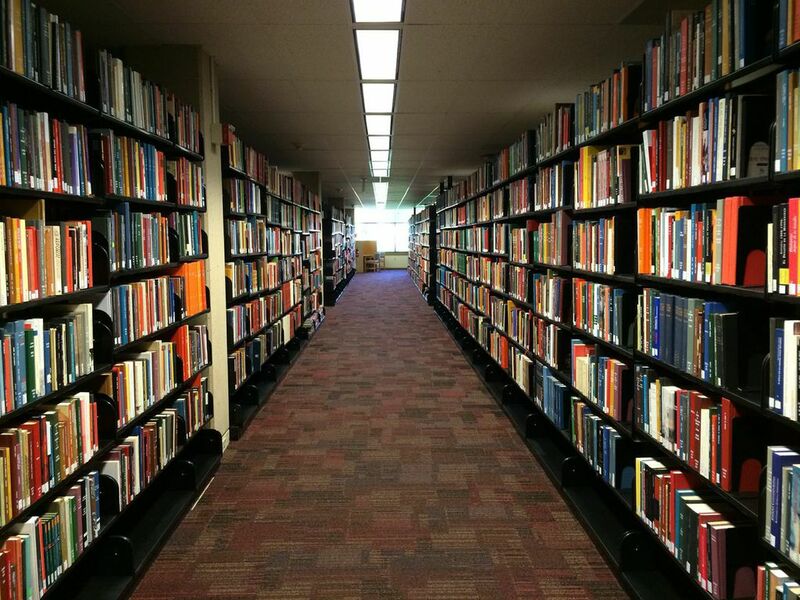 There are 20 libraries the university supports and they house more than 9.3 million physical volumes. In addition to the physical volumes, the university also offers e-books, audiovisual materials and thousands of digital resources. Approximately 97 percent of all undergraduate students live on campus. Undergraduate students are guaranteed housing for four years. The university offers 80 diverse housing facilities including residence halls, apartments, suites and small group houses. The university also has fraternity and sororities that offer housing. There are over 600 organized student groups at Stanford. There are athletic/recreational, career/pre-professional, community service, ethnic/cultural, arts, political/social awareness and religious/philosophical themed organizations. When colleges say that you can find whatever you’re looking for in student activities – Stanford really means it. There are so many options to get involved on campus. When talking about student activities, you can’t leave out athletics when talking about Stanford. Stanford University competes in the Pacific-12 (Pac-12) Conference. Stanford’s biggest rival is the University of California, Berkeley (Cal), and one of their largest traditions is “The Big Game.” “The Big Game” is the annual football game against Cal and is preceded by Gaieties, student-produced musical follies. I had the privilege to attend a few of the Big Games a few years ago and I can only describe it as being extremely exciting. Students wanting to apply for admission to Stanford University can apply using the Common Application. Stanford requires the application, the Stanford Writing Supplement, $90 application fee, official test scores (SAT or ACT Plus Writing), School Report, Official Transcript(s), Two Teach Evaluations and the Midyear Report. Stanford offers Restrictive Early Action (due November 1) and Regular Decision (due beginning of January). Students that apply Restrictive Early Action will typically have an application decision by December 15. 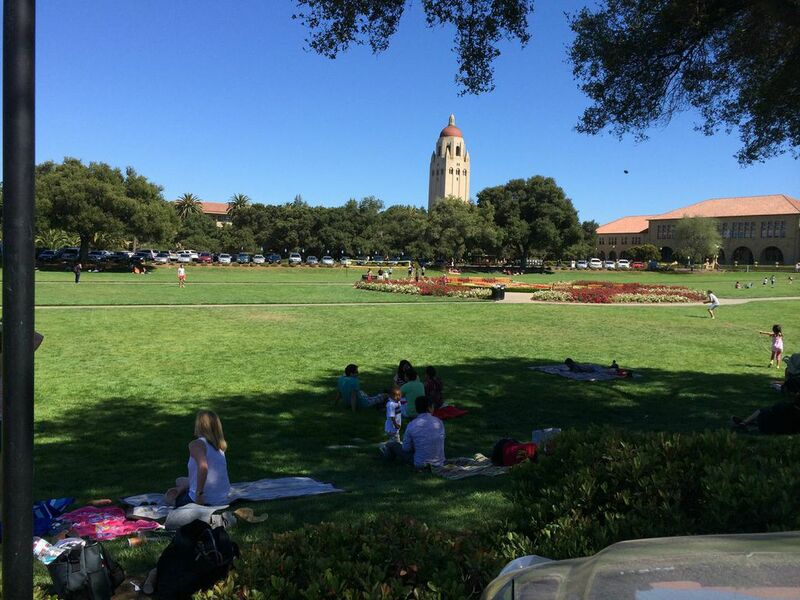 Students will still have until May 1 to decided if they will attend Stanford in the Fall. The “restrictive” part just means that students agree to not apply to another early action, restrictive early action, early decision or early notification program. Students that apply Restrictive Early Action can still apply to other colleges under Regular Decision. There is no away around it – it will be hard to get into Stanford University. Over 42,000 students applied for admission for Fall 2014. Just over 2,000 students were offered admission. The acceptance rate for Stanford this year was only 5.1%. Admission will be very competitive. Academically, the majority of students accepted to Stanford are at the top of their class and scored high on the SAT or ACT. However, academics are not the only things the admissions office will be looking at when making admission decisions. They will also be looking for in depth extracurricular activities, excellent writing and extraordinary evaluations from teachers. Who Is A Good Fit For Stanford? Stanford University is a good fit for students looking to be challenged academically. Students that attend Stanford are some of the smartest students in the country. Even the students that are accepted to the university will be quite surprised at the level of work and challenges they may face at the university. Students that are not easily discouraged will fit well at Stanford. Stanford University is also a place for students that are hardworking and dedicated to their studies and their futures. To be success at the university, students will have to work harder than they are probably used to, but the benefits of the hard work will show itself later. Stanford University has a tremendous list of graduates and many of the students that graduate now go on to do amazing things. Interested in Stanford? Find out more! Stanford University makes it very easy for students to visit campus. They offer guided campus tours daily, including Saturday and Sundays. In addition, they offer a self-guided tour online and an app for smartphones. You can also sign up to receive more information and be notified of important information. To see more photos from my visit to the Stanford University campus, check out my Flickr Album. what are the buildings on campus? what are the few majors the school offers? What major is the school known for? how competitive is it to get in? How long dos it take to take a degree? What courses are needed to take to meet the entrance requirements? What is the average GPA,SAT/ACT score? Hi Ivanna. Stanford is an amazing university, and also one of the most prestigious in the world. Last year it had the lowest acceptance rate in the United States, accepting only 5% of the students who applied for admission. Therefore, it is very competitive to get in. The most iconic building/tower on the Stanford campus is probably the Hoover Tower. Another iconic place on campus is The Oval. Students and visitors hang out on The Oval all the time and there is a beautiful garden shaped like the Stanford ‘S.’ Many students at Stanford are able to get their degree in four year. A more common statistics you’ll find for many colleges is the six-year graduation rate (meaning students graduate in six years or less) – Stanford’s most recently reported six-year graduation rate is 95%, which is really high compared to other colleges in the country. Many students who are accepted to Stanford has high GPA and test scores, but Stanford takes the holistic approach and does take other things into account. However, if Stanford is a school you want to attend, students should strive to do well in classes and take challenging classes (AP, IB and honors courses). The academics at Stanford are amazing and the most popular majors vary. Some popular majors include Biology, Computer Science, International Relations, and Economics. 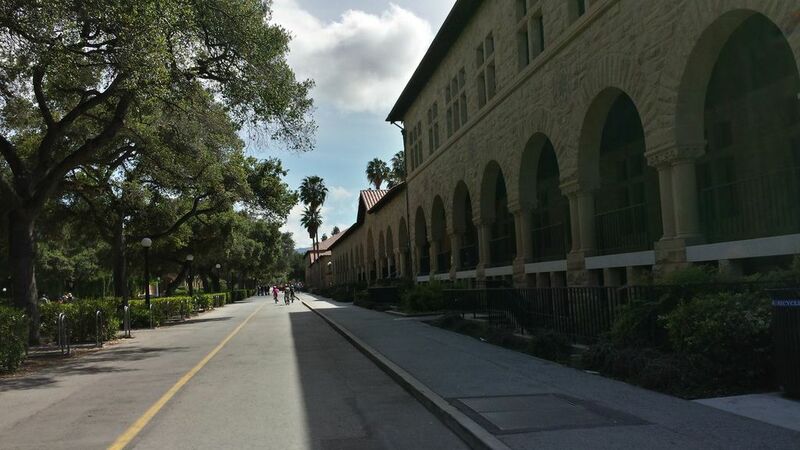 If you’re really interested in Stanford, check it out – check out their website, check out virtual tours (check out YOUniversityTV.com or YouVisit.com), and visit.